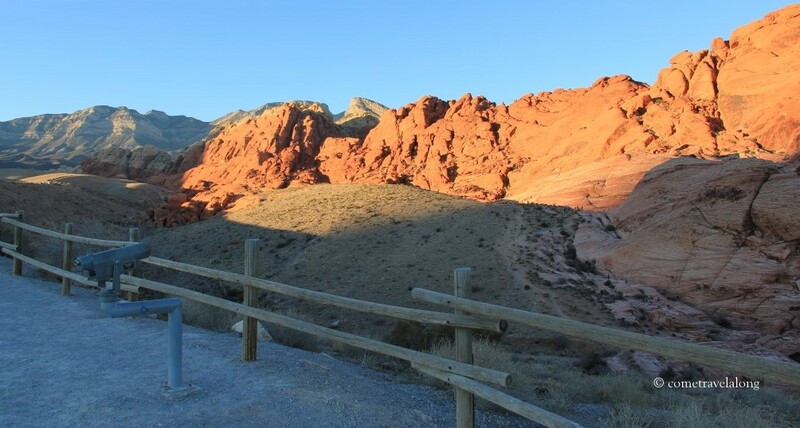 We visited Red Rock Canyon in winter 2013. 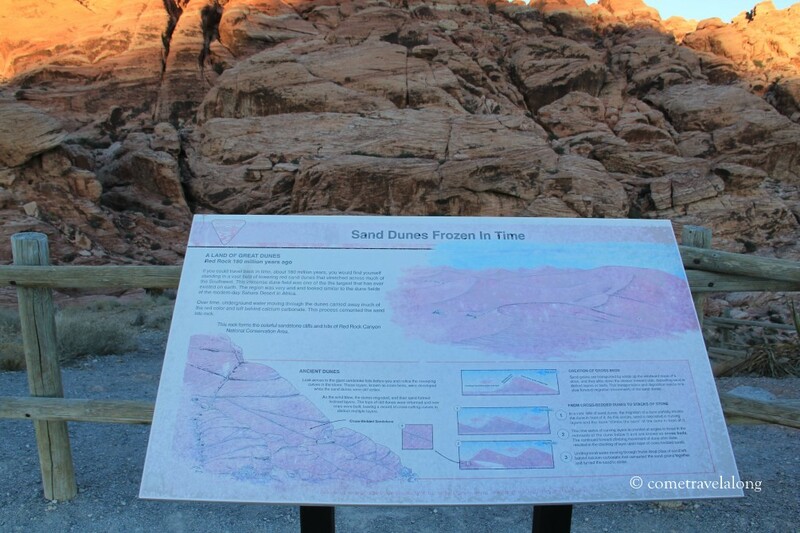 It is located 17 miles west of Las Vegas in Nevada. This area is visited by over 1 million visitors each year and it showcases a set of large red rock formations. The area has a visitor center which also features outdoor exhibits. 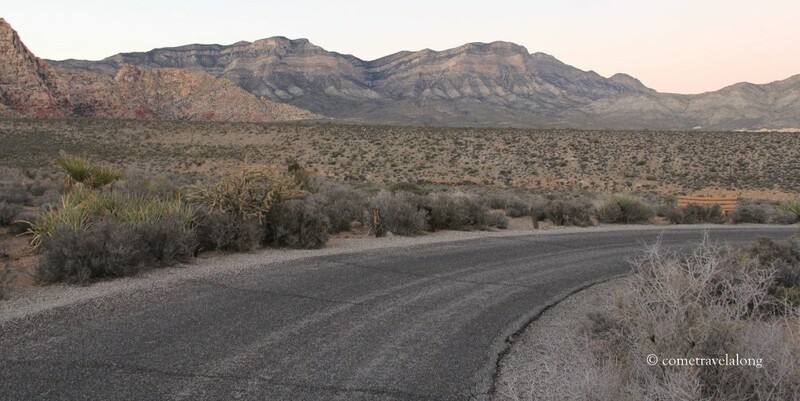 There is a one way scenic loop road about 13 miles long which provides access to many of its features and hiking trails. Since we reached during evening there was not enough time for hiking. We visited the visitor center and took the scenic loop around. View from the visitor center. 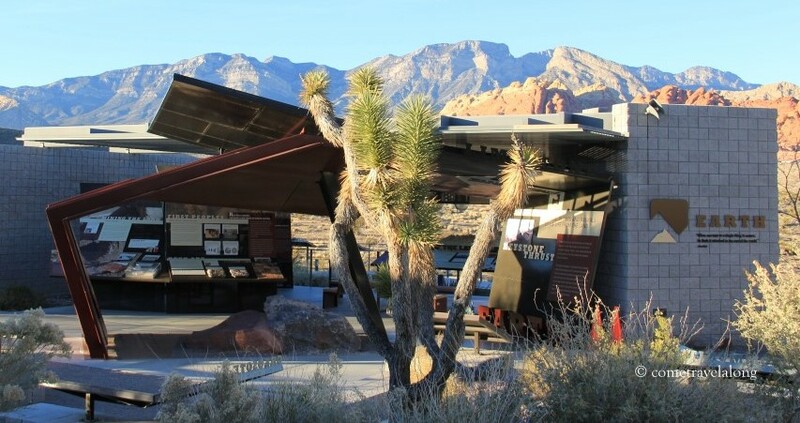 The outdoor exhibit area at the Red Rock Canyon. 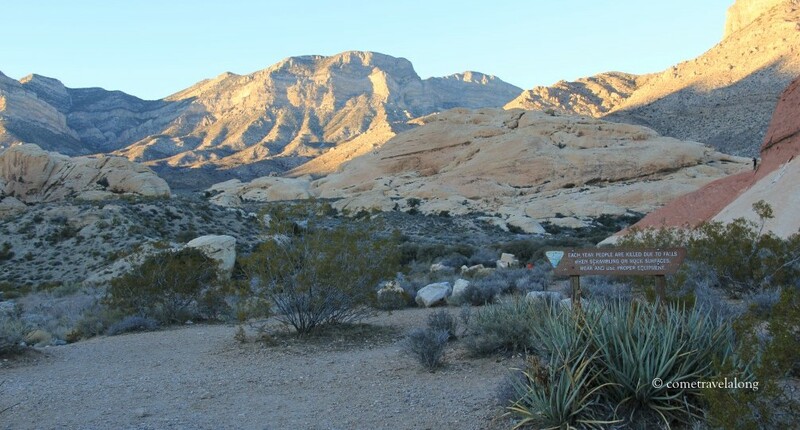 Red Rock Canyon is a part of the Mojave Desert and the temperature here is very hot during summers. This exhibit provides more information about the summer season. We enjoyed reading the exhibits and gathering more information. This was another exhibit on desert heat. The iconic Las Vegas sign. The rays of the setting sun were shining bright on the red rocks in front of us. There were also hiking trails at this area. 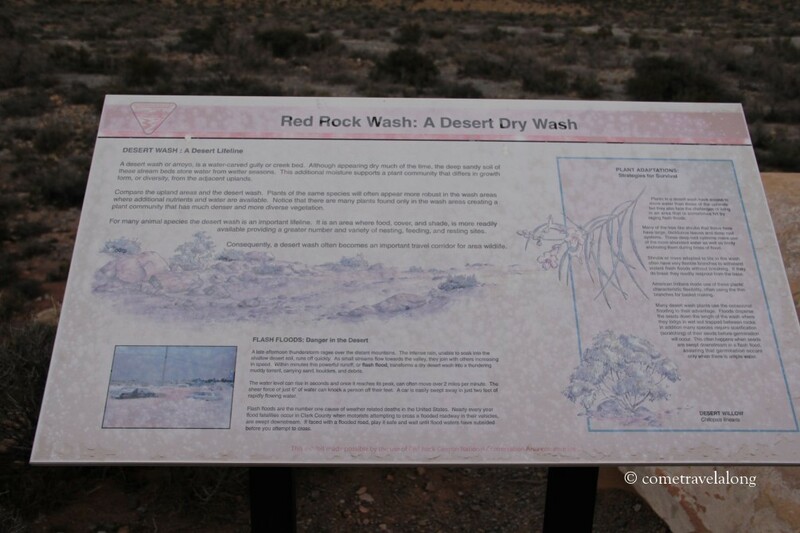 We drove further and reached the ‘High Point Overlook.’ We could see the vast dry desert with desert trees. Further on the road we reached the ‘Ice Box Canyon’ overlook. The sun was setting now and it was starting to grow dark. 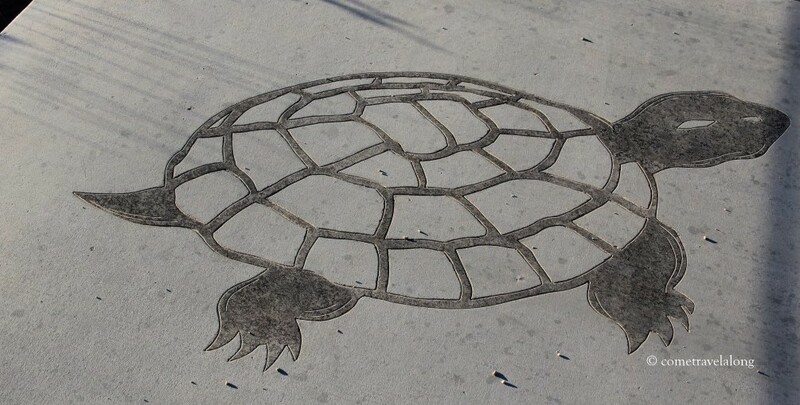 Art at the pavement of visitor center. Many people had completed their hikes by now and were leaving from the area. After completing our loop journey we headed back to the glittering night at Las Vegas. We visited Red Rock much earlier and enjoyed the one trip there. Nice set of pictures. Thank you Betty! Good to know you had fun time too. We reached a little late and could not do any hikes but still enjoyed the little time we spent there. Really beautiful. Gorgeous captures too. 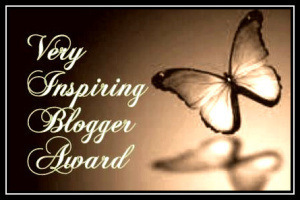 Thank you for your generous words and your visit here. Great tour Ruchi ! 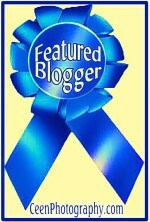 Amy has also covered Great Canyon in her latest posts. This place is amazing and I wanna capture these magnificent rocks. Thank you PJ! The place is definitely very hot in summer. Could not believe that Las Vegas is actually surrounded by dry desert. No kidding! LV is really something to see. This is one of my favorite places to go. We go hiking during the spring with my 3 year old and we have picnics up there. I have many pictures of the mountains and foliage. Enjoyed this Ruchi. 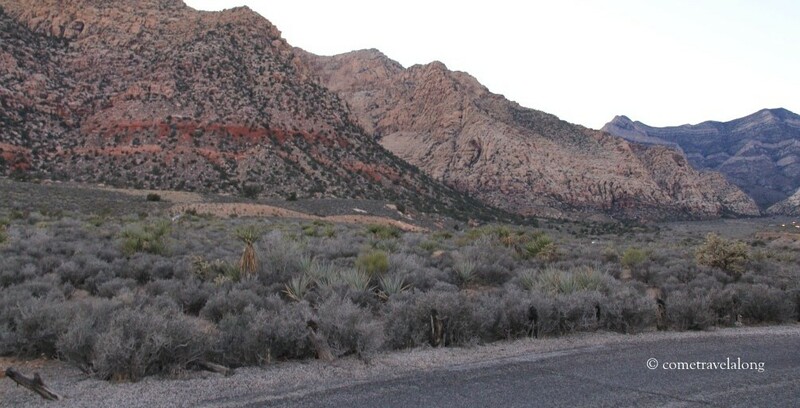 Somewhere I read about Red Rock Canyon not to long ago about people who go to Vegas and never go to nearby places such as this. There is actually lot of natural beauty around Vegas. We had planned and explored the region and it was worth the visit.